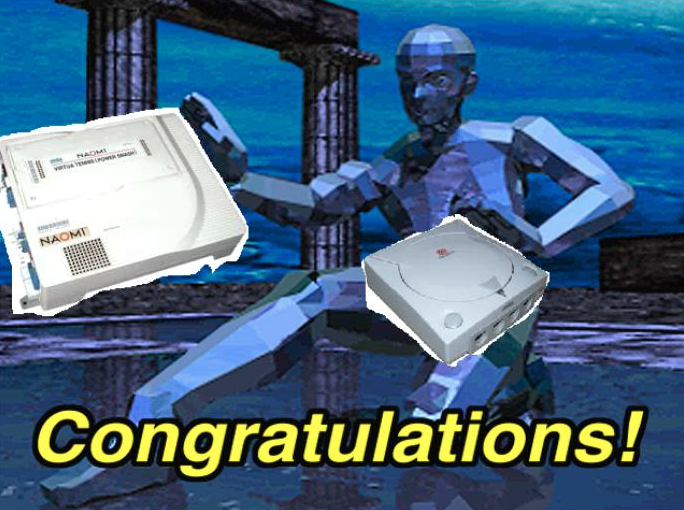 As we all know, the Dreamcast wasn’t an only child. It was one in a fairly large family of systems that shared many of the same components, specs and sharing the Katana SDK with our beloved DC. 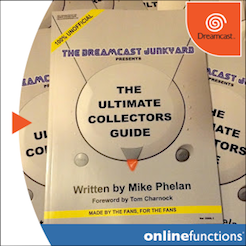 And that is where the focus of this; the first of three parts in a series entitled 'Expanding the Dreamcast Collection' will begin. 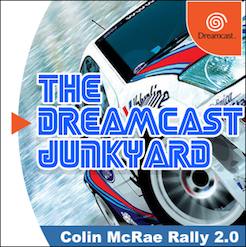 Later parts will detail games and ports from other systems in the Dreamcast family and finally cover some of the games originally penned as Dreamcast games that eventually went on to be released on other formats. You may say that these are not technically Dreamcast games, but my argument is that they were built to run on similar spec hardware with the Dreamcast’s capabilities in mind, often by the same development teams and were released at a similar point in video game history. These factors combine to make them feel very Dreamcasty. 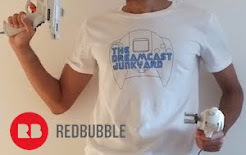 In fact a number of them feel more Dreamcasty than many actual Dreamcast games do. Who could argue that Soldier of Fortune and Spirit of Speed feel more Dreamcasty than the likes of Code Veronica: Gun Survivor, Slashout or Dynamite Keiji (Deka) EX Dynamite? Anyway, I think I’ve argued my point long enough. Let’s get started. The Naomi was first announced in 1998 shortly before its first release The House of the Dead 2, but the story begins long before that. 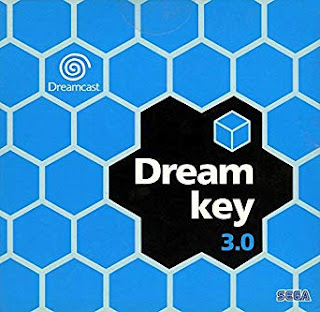 It's well known that the Dreamcast was originally codenamed 'Dural,' but this was at some point changed to 'Katana' before finally the name 'Dreamcast' was settled on. Some claim the Naomi was based on the Dreamcast’s architecture, but I have a slightly different theory on the matter: the Naomi almost certainly existed earlier or, at the very least, had been in development alongside it from the start. Firstly, let’s first look at the original name - Dural. Dural is the famous final boss character from the Virtua Fighter series; a series synonymous with the arcades, especially in its homeland of Japan. Every iteration of Sega’s famous 'Model' arcade hardware featured a Virtua Fighter game at launch to showcase its capabilities and push arcade operators to adopt the new technology. As such, Virtua Fighter 1, 2 and 3 were respectively released on Sega Model 1, 2 and 3 arcade systems at launch. The console versions of Virtua Fighter have always played second fiddle to the arcade which makes Dural a very odd choice of name for a new Sega home console. Bow down to the power of my Photosh…I mean Paint skills. "The origin of the name 'Naomi' came from the idea that the system was intended to be a continuation of the Model 3 arcade board and so has the meaning of 'Final Model' or 'Super Model.' It is said for that reason, they named the system after the famous fashion model of that time, Naomi Cambell. Finally, the day before the official announcement of the system, it was officially named 'New Arcade Operator's Machine Idea' according to the official webpage." This explanation also parallels the name Dural in that it's the final boss of the Virtua Fighter series; an overpowered 'final boss' or 'super character,' if you will. Model 1, Model 2, Model 3, Final Model Super Model = Naomi Campbell = NAOMI. I never did move on from Paint to Photoshop, I’m so ashamed. 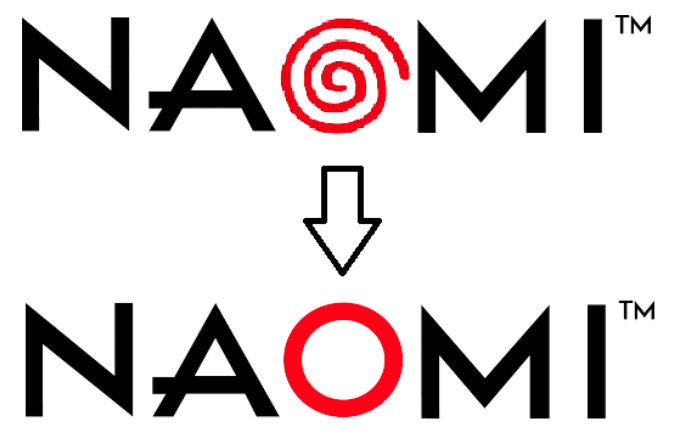 Further evidence of the Dreamcast Naomi link can be seen in the Naomi logo. 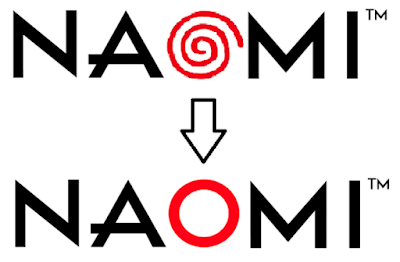 The final design of the Naomi logo as we know it today is simply the text “NAOMI”, “N”,“A”,“M” and “I” in black with the “O” displayed in the colour of the famous Dreamcast swirl. 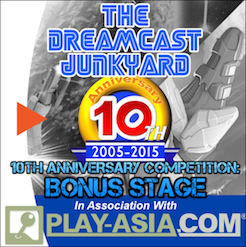 When the system was first unveiled at arcade trade shows the logo in fact used the Dreamcast swirl in the place of the O. 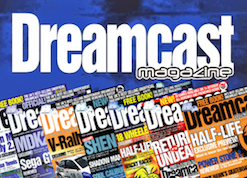 This caused confusion among attendees and was read by many as “NAMI”, for this reason the logo was redesigned in its current form, but the colour of the O was left unchanged in an effort to show the system’s connection with the Dreamcast, or possibly the Dreamcast’s connection to the Naomi. Top: My mockup of what the original logo could have looked like. Bottom: The official Naomi logo. 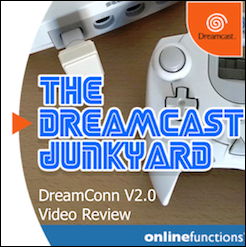 Did you ever wonder why the Dreamcast was the only console to ever feature VGA output? This is another throwback to its arcade roots. The Naomi was built to use the JVS arcade standard, an arcade connection standard to replace the former JAMMA standard. JVS, instead of outputting video via the RGB connection on the JAMMA harness (arcade standard connection of the time), uses a 480p 31kHz signal via the VGA cable. The newer arcade cabinets at the time (Naomi Universal Cabinet, Net City, New Net City etc., support 15kHz (for use with standard JAMMA motherboards), 24kHz and 31kHz (for motherboards that support JVS) where as older cabinets could usually only accept 15kHz. In order to be compatible with both the older JAMMA and newer JVS cabinets, the Naomi (just like the Dreamcast) is also capable of booting in either 15kHz or 31kHz mode. To this day, the Dreamcast remains the only home console other than the Xbox 360 (that I’m aware of at least) to have ever supported VGA. It’s just not practical for a home console as very few televisions ever supported it and sharing a connection on a single monitor with a PC is simply inconvenient. The only reason the Dreamcast features VGA compatibility is clearly because of its arcade lineage. Furthermore, I've never bought the story of Sega developing two new home consoles simultaneously in America (Blackbelt) and Japan (Dural/Katana). Why on Earth would a company in such dire financial straits as Sega waste their resources and millions of dollars on two projects knowing that one would never see the light of day? It makes much more sense that Sega of Japan were developing the next in the series of their successful Model arcade boards, while development of a new home console was delegated to America. For various reasons (you can read all about them elsewhere online) the Blackbelt's development was ceased and Sega of Japan instead decided to work towards creating a unified format that aimed to bridge the gap between their arcade and home console output. Evidence that Sega was moving in this direction can be seen in the way Sega restructured their AM (Sega Amusement Machine Research and Development Department) Divisions. 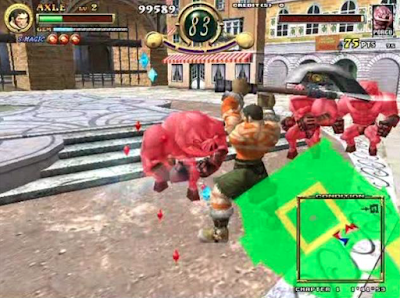 With the exception of AM2, all divisions were renamed and studios which had previously focused all their efforts on arcade releases, began spreading their development across arcade and home consoles. 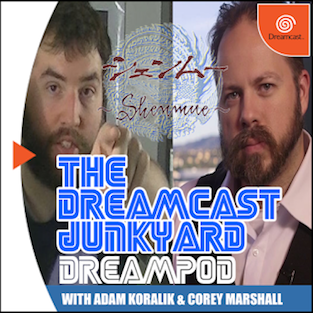 What's more, both the Dreamcast and Naomi utilise the Katana development kit and SDK libraries to make it easier for developers to switch between development from one format to the other. So the Naomi was already well on the road to completion when the decision was made to use the system as a basis for Sega’s next home console. Perhaps the original plans for the NAOMI entailed a more powerful system with far higher specs which were eventually lowered in order to make the system more affordable for the home market. Perhaps that’s the reason we didn’t see a Virtua Fighter game until Naomi 2. Unfortunately, the development process of these systems is not well documented publicly, so unless someone who worked for Sega at the time ever confirms my suspicions, we'll never know for sure. What is clear however, is that the link in development of these two systems was very strong, each was developed with the other in mind; the Naomi platform wouldn’t have had the amount of success and support it received, had developers not been able to easily port to the home market, and the Dreamcast would certainly not have had such a huge library of arcade-perfect ports had it not been for its close relationship to the Naomi. The success and failures of each system had a knock on affect on the other. 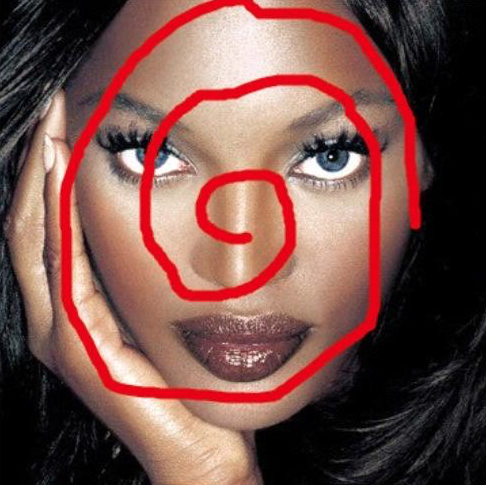 Any Dreamcast fan owes it to him or herself to discover the less publicised side of the Dreamcast: the Naomi. A spin-off from the 'Spikeout' series (a series of 3D beat 'em ups originally released in the arcades on Sega Model 3 hardware but never ported to home consoles), Slashout retains the four cabinet link up feature pioneered by the original Spikeout. The controls can take a while to get used to and the enemy designs admittedly feel a bit uninspired and repetitive at times, but the core gameplay is solid and offers anyone who plays it a fun experience and more than enough challenge. I highly recommend this one. annoying bastards if you let them surround you. Firstly, do not confuse this with the later Wii and DS releases, Jambo! Safari: Animal Rescue. From what I can tell, after playing those versions for 20 minutes or so, they are completely different games that don’t retain any of the charm from the original. In Jambo! Safari you control a Park Ranger whose goal it is to chase down wild animals in a Jeep. Once within range, the player must time the release of a lasso. If successful, the animal is caught and extra time is awarded to the player. Imagine Crazy Taxi but swap San Fransisco for the African Serengeti, the passengers for wild beasts and the goal for lassoing terrified animals...and you’re halfway there. 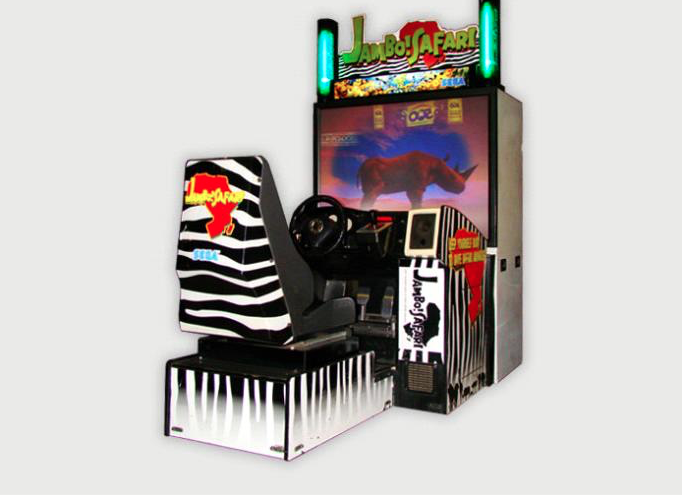 To be honest, most of the fun with this one is in the design of the unique Jeep cabinet, so it’s probably better to try and track down the original in an arcade rather than settle for emulation. I’m a despicable poacher in search of ivory and fur. Now this is an odd one. 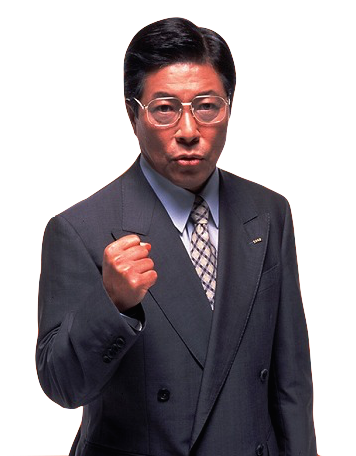 As we all know, the original Dynamite Cop (Dynamite Keiji (Deka) 2 was ported by Sega from Model 2 arcade hardware to the Sega Dreamcast fairly shortly after launch. This version on the other hand was created by a Chinese development studio under supervision from Sega of Japan and is essentially a re-skin of the game that we all know and love. While the goal of rescuing the president’s daughter remains the same, the player must now infiltrate a Hong Kong sky scraper rather than a ship. The layout and structure of the levels haven’t changed at all, but the 3D models used here are completely different. If you haven’t played the original in some time, you might even be fooled into thinking it’s a completely new game, but the more keen eyed players among you will certainly have a feeling of deja vu. Gameplay wise, the game hasn’t changed much. The biggest difference is that now each of the three characters has not only their default fighting style but also three other unique fighting styles acquired by picking up costumes throughout the levels. These range from the strange to the downright ridiculous and are what make this game worth checking out. 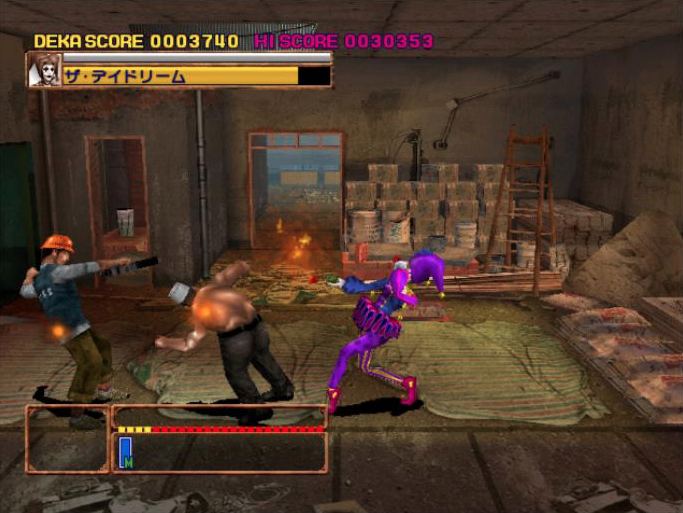 I’d love to see an indie dev team somehow replace the textures and features from this game into Dynamite Cop 2 and release it on Dreamcast, but until that day comes, the only way to play is on Naomi. This costume bears a striking resemblance to NiGHTS, don’t you think? 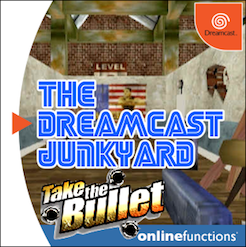 A better than average Namco lightgun shooter that feels very much like a Sega lightgun game. 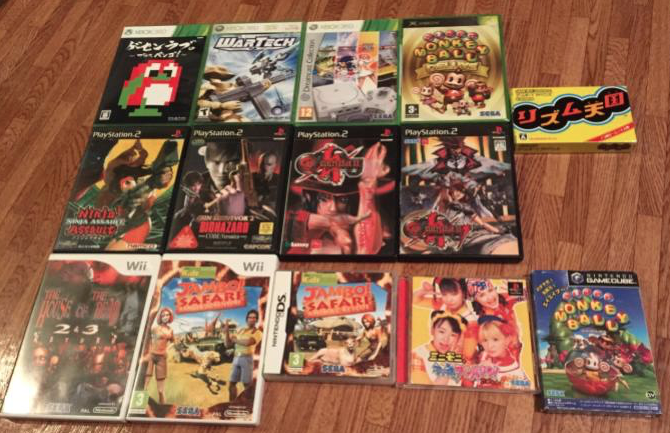 Although it can’t top the best of the Virtua Cop or The House of the Dead series, it still holds its own fairly well and is definitely worth the asking price of 5-10 pounds. Another very unique game right here; made by shmup kings G.Rev, this one combines 2D shooting gameplay with one on one fighting to brilliant effect. I thoroughly enjoyed this one on release, especially the multiplayer, both online and off. 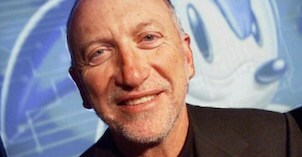 The 360 game is actually an 'enhanced' version with slightly better graphics. A sequel was also made but remains exclusive to Japan. This game actually started life on the Gameboy Advance before being ported to the Naomi. Yes, that’s right. A Nintendo Gameboy game was ported to the Sega Naomi making it significant for two reasons: one, it is probably the only GBA game to have ever been ported to arcade hardware and two, it is the only Nintendo game to have been released on any of the hardware in the Dreamcast family. OK, what can I say here that hasn’t been said already a hundred times over? It’s Monkey Ball, we all know the score, but what many people don’t realise is that Monkey Ball started life in the arcade on Naomi hardware. For the console release extra features were added and the visuals were given a graphical upgrade that presumably justifies the word 'Super' added to the title. Rather than a regular analogue stick, the cabinet utilised a giant banana shaped analogue joystick. Definitely worth checking out if you’re ever lucky enough to find the arcade original arcade cabinet out in the wild (I never have :( ). If not then the Gamecube port plays just as well. There are a few options when it comes to playing arguably Sega’s most successful arcade system of all time. I’ll give you a brief rundown of them below, but I suggest you research further before clicking 'Buy It Now' on that overpriced eBay auction at 3am while sipping a can of Special Brew (we've all been there - Tom). There is of course the option of finding an arcade that still houses these machines, but I’m going to presume you’re perfectly capable of walking into an arcade and dropping a pound/dollar into a slot without my guidance. The easiest option when it comes to playing on the original hardware. Sure, they may be difficult to find and move, but once you’ve got one in your house, you’re ready to go. Just connect the Naomi up to the appropriate cables and connectors within the cab and you’re laughing. 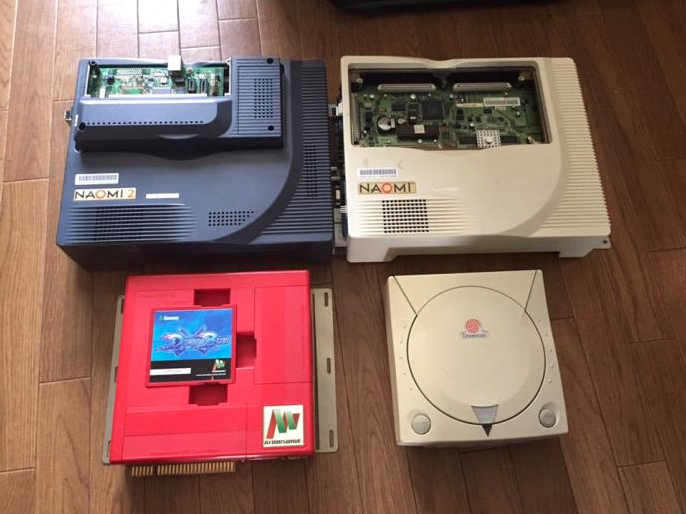 I recommend a cab manufactured by Sega such as the Naomi Universal Cabinet, Net City or New Net City as they also come with the correct voltage power supply and wiring to support the Naomi and its add-ons such as the GD-Rom drive and Net Dimm. Older arcade machines won’t accept the JVS standard that the Naomi uses, but there is a way around this. 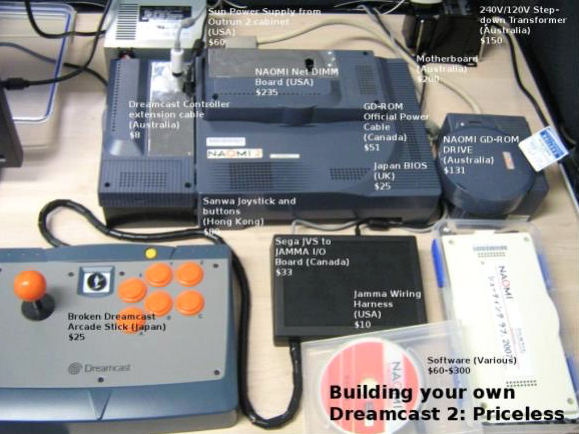 Arcade manufacturers such as Sega and Capcom made converters called I/O boards that convert the VGA signal and USB controls from JVS systems to one that an old timer JAMMA arcade machine can understand through its standard JAMMA pinout. It’s widely agreed that the best I/O board to use is the Capcom I/O as it is accepts a Capcom kick harness and supports controls for four player games such as Power Stone 2. 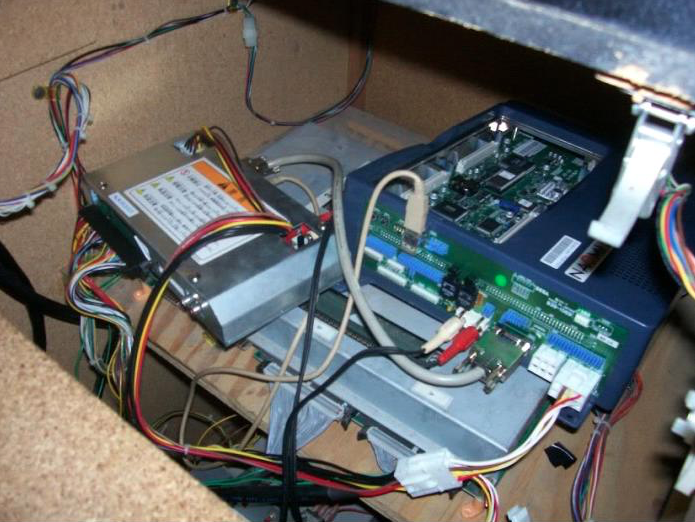 Not only that but it also contains an audio amplifier and lets you power the Naomi straight from the JAMMA harness. Be warned, when using this method, the Naomi will not be able to draw enough power to use add-ons such as the Net and GD-Rom dimm boards. You’ll need to buy a modified Dimm and Capcom I/O or mod the connector on your own power supply if you plan on using anything other than cartridges. For those of you who don’t have the space for a full sized cabinet, this is a great solution. Superguns were designed to allow people to play or test arcade boards on a regular TV. While JVS Superguns do exist, most are JAMMA only and so you’ll have to also order an I/O board of some sort and will experience the same problems found when using a JAMMA cabinet if you intend to use add-ons. This option is perhaps the cheapest way to play on original hardware but be warned, it’s only open to the more technically minded of you. As mentioned earlier, the Naomi outputs video through a VGA cable and so displaying it on a regular 30Hz compatible PC monitor or television is easy. The difficulty comes with powering and controlling the thing. You’ll need to splice the cable on a PSU to connect to the Naomi properly, as well as find a way of connecting controls to a JAMMA harness, and then finally use an I/O board like the ones I mentioned above to convert them to the JVS standard. Doc Eggfan/Scott Marley’s Naomi set up. The cheapest and easiest way is to simply use an emulator. Most of the popular Dreamcast emulators are also capable of emulating the Naomi, so if you’re already familiar with Null DC, Demul or Makaron then you should have no problem with loading up some classic Naomi games. You’ll need a fairly modern PC to get the best results and as with all emulation, some games work better than others or simple won’t run at all. Not perfect, but the only way for most of us to play the Naomi exclusives that never made it to home consoles. There is of course one last way to play Naomi games: console ports. We already know all about the Dreamcast ports but other systems that were lucky enough to get Naomi games include PlayStation 2, Gamecube, Xbox, PS3, Wii and more. Take a look the full list of Naomi games at the bottom of this article to find out which games received ports. This should have given you a good introduction to the Naomi, but I just can’t stress enough how much this should only be viewed as a brief guide to the system. The Naomi enjoyed official support for almost ten years and like the Dreamcast, you could fill multiple books on the system architecture, games and history. 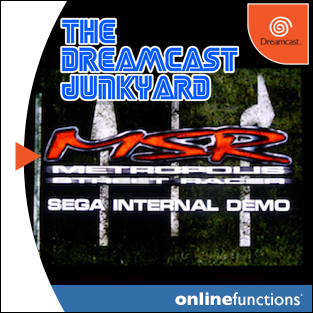 Look out for part two where I’ll be talking about the remaining systems in the Dreamcast family, their games and respective ports. I know how much you readers like a good list so check out the one below detailing every game made for the original Naomi. If the game was ported to any other system I’ve made a note of it in brackets. If I’ve missed any games or ports in this list, please let me know. I hope we can work towards creating a complete list of all the games in the Dreamcast arcade family and their respective ports. Great article Ross. The list of games is helpful to me. Great article Ross, the stuff about Naomi Campbell is probably the first mention in Western media, which is great stuff. Also, Doki Doki Idol Starseeker, (G.rev's first game based on minesweeper, which was developed quickly to get some revenue streaming in when they first started) did get a DC port. I'll double check the rest of you list, but it seems pretty comprehensive apart from that small omission. Deef I'm not sure if a port exists for PC in Japan, I've done research in English and Japanese and can't find anything so we'll have to assume not for now. I'm not sure why, but I just had a feeling there might be a PC port. Maybe something went wrong in formatting. As for Doki Doki Idol Starseeker, thanks for pointing that out. I welcome anybody to correct or add to this list. Virtual On:OT. It's also available on 360. Karous, Chaos Fields and Radio Allergy all got released on the Wii as well. And Finally, why is Charge N' Blast on the list? Is it not a Naomi release that eventually got ported to DC? I always see this game missing in many Sega Naomi lists. Why is that? Yes, Virtual On needs to also have 360 in the brackets. Karous does actually already have Wii in brackets. Chaos Fields and Radilgy are missing Wii in brackets. I didn't even realise Chaos Fields got a port to the system to be honest. Is Radilgy Noa for Wii the same game? If so then well spotted, that also needs to be corrected. Charge and Blast I must have missed. 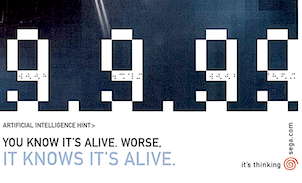 It needs to be added to the 1999 cart section. No problem. It's a wonderful article. Just wanted to make sure the info is as accurate as possible. The reason I mentioned all 3 including Karous is because they are all part of a compilation disc on the Wii that has all 3 games. In the US it's known as Ultimate Shooting Collection. 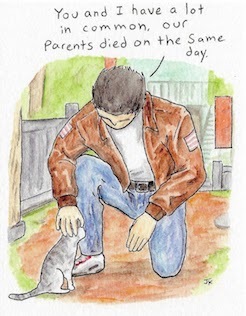 It has a different title in Japan I believe. I see. That does ring a bell now you mention it. According to Wiki the pack was titled Milestone Shooting Collection: Karous Wii in Japan. Hopefully Tom will see all this and update it when he has the chance. To be honest, I was expecting a few mistakes in the list, especially as I was more focused on the non-Dreamcast ports, but it's great to see other people care enough about this topic to help correct it. 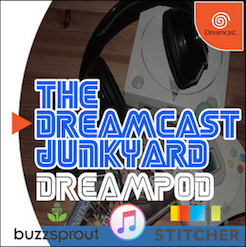 It would be great to have a complete list with all ports etc as it's a vital part of the Dreamcast's history and something that hasn't been done before to my knowledge. Cheers Tom. Btw shooting club also needs to be in blue. My mistake. Great Article it is awesome to see such love for the Naomi, just as an added piece of information the PlayStation 2 had partial support for vga output it came with the rare Linux conversion kit, two OEM editions exist and only one "true" aftermarket version exists. Most aftermarket versions are svideo signal converted to vga. The problem is the vga relies on sync-on-green and one of the few companies that made sync-on-green was Sony (see what they did there) anyhow only three or so games supported it. With soft modding you can force games to play on the cable. It's awesome when you get it working because the video quality is better than component looking good even on flatscreen a and it auto switches between 16:9 4:3.